It’s all down to your siblings! If you have siblings and you’re not the oldest, your happiness is doomed to be at risk. The first child can do whatever it wants, it can pursue any career or hobby. The second child is in a tricky position. It wants to be distinct, i.e. different from its sibling, thus it doesn’t want to do whatever the first child does (or even did). For any following children, there will be even fewer niches open. Despite having a few way older half siblings and a very young half sister I would consider myself second-born because, for most of my life, I grew up alongside my 4-years older sister. I can definitely see the theory somewhat applying to my life. For example: My sister used to be very big on dancing and even though I really loved it too, I didn’t pursue it because it was her thing and I wanted to have ‘my own thing’. However, as you age you grow out of this ‘sibling-competition’, particularly because you start to actually live your own life rather than keep trying to impress your parents (plus, as adult you can think and reason, which children don’t do all that much 😉 ). So it’s seems like birth order – i.e. 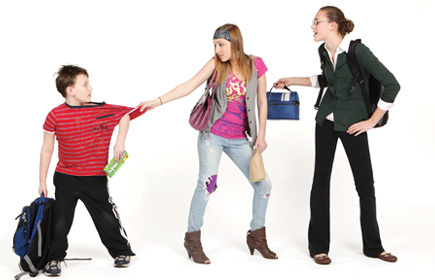 your older siblings – can determine what sort of activities you pursue. Research furthermore shows that there’s even a relationship between birth order and personality (e.g. Sulloway, 1996). oldest children: confident, motivated to achieve (no older siblings to mock them when they try something new), perfectionists and having a hard time admitting when they’re wrong, may become over-achievers as new parents may be very protective yet strict and demanding. Interesting fact: more than half of all Nobel Prize winners and US presidents have been first-borns. middle children: as already mentioned, the second born seeks to be different from the first-born, which makes it difficult to label them as their personalities largely depend on their perceptions of their older sibling(s). They may feel like the oldest is given all advantages and the youngest is the family’s spoilt darling and thus become good negotiators, realists, and independent. youngest children: the parents are by now quite experienced and likely to be less strict, which allows the family’s baby with the least responsibilities to become more carefree, easygoing, affectionate, creative and be spoilt. They may also be rebellious in order to stand up to their stronger, bigger and smarter siblings. only children: similar to first-borns, and as they are mostly surrounded by adults they may act older than their years, they may feel more important as they never had to compete for their parents’ attention, and may also share some characteristics with youngest children in terms of being a little spoilt. These trends can be completely different though in various families, depending on different circumstances, personalities, age gaps, etc. See this article ‘Sibling-order effect‘ for more information. This entry was posted on 05/06/2013 by G in Miscellaneous, Psychological Issues and tagged birth order, competition, oldest, order effect, parents, siblings, youngest.